PPS now has it’s own forum, which we will provide more detailed and frequent updates on MMR, usually weekly. This blog will continue and contain updates as well but more general in nature. Anyone can register on the forum. This entry was posted in Medieval Madness Remake! (MMR) on November 2, 2014 by admin. MMR Video NOW Available featuring Roger Sharpe! The MMR promotional video featuring Roger Sharpe and the one of the MMR pre-production game that was just built a couple of weeks ago is now available … Enjoy! This entry was posted in Medieval Madness Remake! (MMR) on September 11, 2014 by admin. Weekly conference calls between PPS, Chicago Gaming, and Stern mgmt to review key status, planning, and any issues to prepare for game production, including scheduling, last details, MMR line status, game status, etc. Transformer issue that had caused some consternation has been resolved! Issue was how spec was interpreted by Tranformer company and was fixed and no longer an issue. Game has passed FCC and CE ! UL certification testing is in process for MMR, which involves various communication back and forth about the game, and a battery of tests in various labs to insure that the game is ‘safe’. 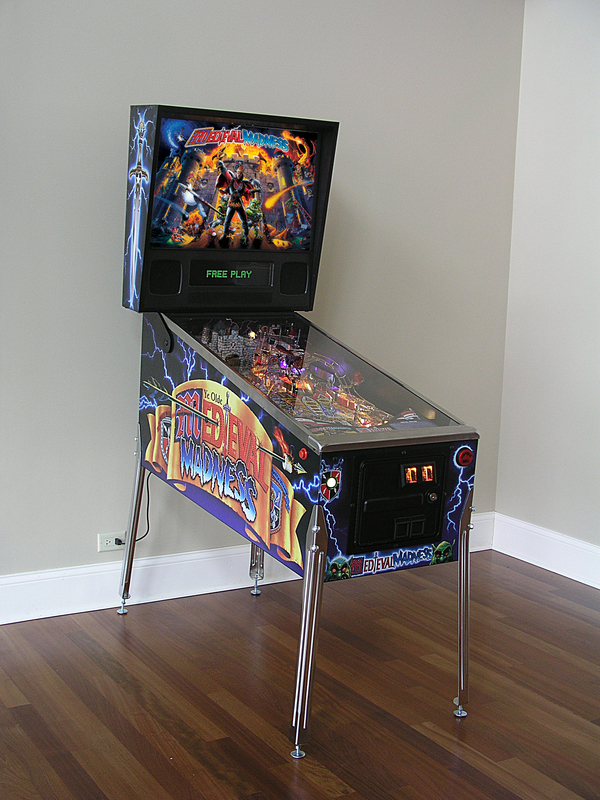 UL is pretty standard for large commercial/home electronic/mechanical devices and something that all major pinball manufacturers certify with. Additional Pilot games are being built now at Chicago Gaming as well as at Stern – one or more of those games will be deployed at one or more test ‘sites’ very soon. We are wating as you are for the MMR Overview Video that should have been released featuring Roger Sharpe. The video exists and is going thru some minor edits to include additional feature description. We are all anxious for it and this is being done at Chicago Gaming so as soon as it’s available we will post it here! 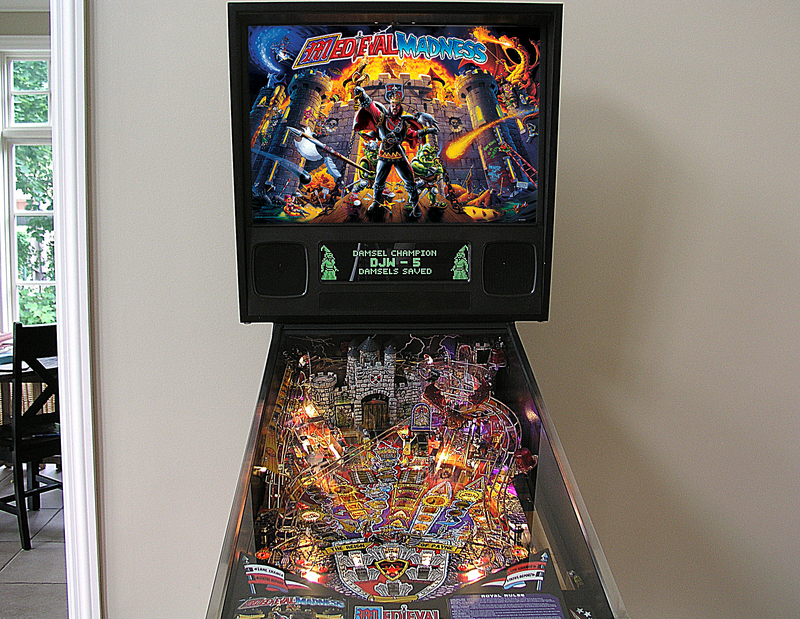 Just going thru final stages of getting everything ready to turn on, so once we get UL clearance, then we will figure out scheduling with Stern who is able to put MMR either on the main line or a newly developed secondary line based on production scheduling – which will ensure that MMR’s will be able to keep rolling regardless of the introduction of any new Stern games. This entry was posted in Medieval Madness Remake! (MMR) on September 9, 2014 by admin. The first pre-production game has been built last week with more coming each week! This milestone is a game using real production (newly produced, procured, verified, and tested), and ready for production. This means that pending the last stages to sign off for the production we are clear in terms of parts. Additionally, most all production parts are have been received, with just a handful of stragglers which do not impact the timeline! Here are some shots of the MMR LE. It was subject to some playing and commenting by Roger Sharpe over the weekend, and we will be having a video of the play as well as a short interview with Roger sometime next week. Enjoy … note … click on pictures to get the large sizes!!! Again … these are pictures from the MMR Pre-Production game which was constructed from new production parts. Another game done now, and more building next week. This entry was posted in Medieval Madness Remake! (MMR) on August 14, 2014 by admin. Hi everyone … we recognize that we are past due for an update and we apologize for that. PPS needed a detailed review of the status from our partners and we now have that. First the not so great news – the ship date of the game has slipped to mid-October. The primary issue was with the original transformer — the initial part was not received as specified and testing uncovered the issue which has been addressed. We just received what we hope to be the final transformerr pending a couple days of testing. Unfortunately that stalled the progress thru UL testing which will now move forward next week, assuming all is OK with the transformer. Production quantities of most all parts have been received and are sitting in inventory. The first pre-production game is up and running built from all new production parts – validating that the parts are correct and ready for the production line. One additional unit will be complete next week. Stern will start building pre-production games next week for manufacturing preparedness. This is an important step – pictures of this game are available and a video soon will be available next week. There are no parts issues, we are tuning some cosmetics but nothing that has any issue impacting the overall timeline. 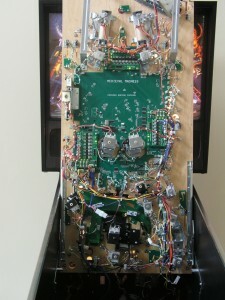 The overall electronics system is complete and the software is ready. We will be putting 1-2 games on test in the next 2-3 weeks somewhere in Chicago (tbd); the proto games have been played extensively. UL testing will continue next week with the final transformer – confidence is high in that much of the preliminary work and any recommendations received thus far have already been incorporated into the game. Assembly options have been upgraded at Stern which includes the ability to build MMR’s on either the main line or a secondary line – this ensures that MMR’s will be coming thru without major assembly delays. 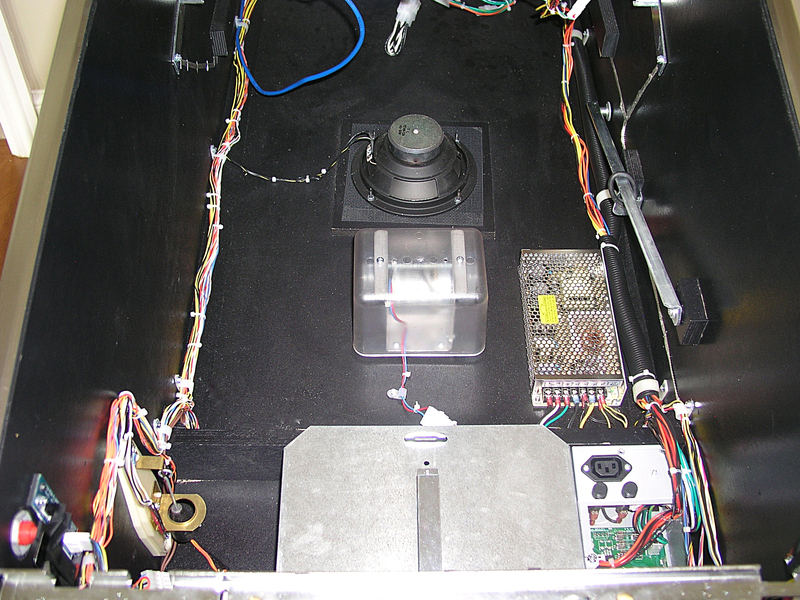 Stern is working with Chicago Gaming on a daily basis finalizing the assembly processes, as well as receiving parts for the game. Final preparations for the build are happening now, and we expect the line to be starting up during the last couple of weeks in Sept. So, while the delay is disappointing, we are more confident in the update on the progress and the plan, and feel that all parties are focused on this timeline. Of course, unexpected things can come up and if so we will update. 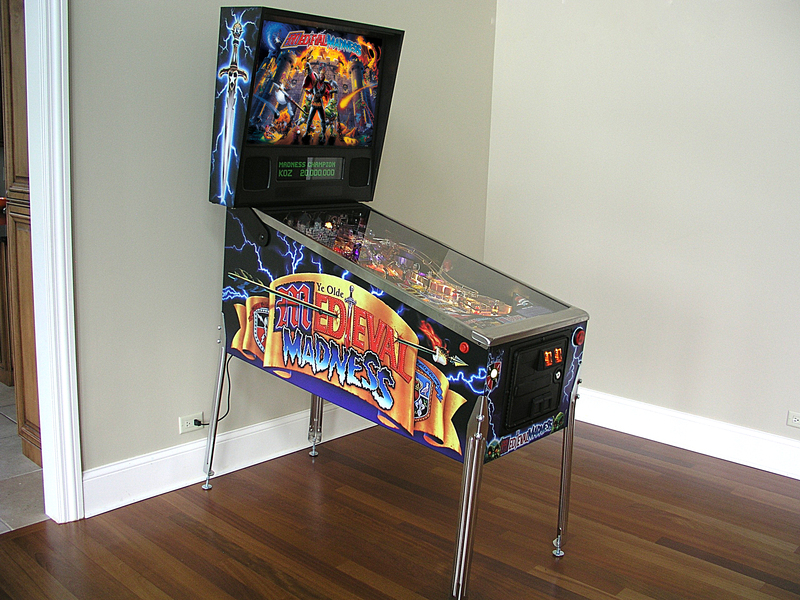 Preparing a game for a mainline manufacturing process requires that everything be ready and integrated into Mfg systems, which puts a strain on everyone, but we are well over the hump which will result in games being delivered at the fastest pace possible. We thank everyone for their support in the project and their understanding that there are always bumps in the road! 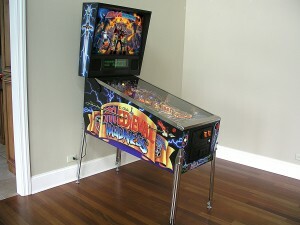 Please look to updates on MMR blog (http://www.planetarypinball.com/category/mmr/) as well as customer communications from your resellers. Everyone on the team from PPS, Chicago Gaming, and Stern believe you will love the game and we are doing everything to meet expectations that you have for a high quality, well ‘re-‘ made classic game! This quick update is about some elements of the MMR which people have been asking about, so here are is a quick up date on a few topics! The LE “Plaque” … all LE owners will have a special plaque indicating the # of the game (from 1 to 1000). Here is the artwork for the LE plaque – we won’t say where the plaque is, how big or small it is, just that LE owners will have them with their game. This plaque will signify that you have a limited edition game and the game number is either pre-defined (for an additional fee) or assigned as the games are built. Main LED Board “Shake Test”! 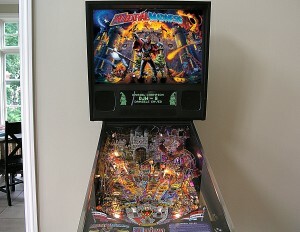 After 250 hours, the board is completely fine, working no issues and the test was stopped. Somewhere in the middle, the only socketed chip got a little loose (which is now wire strapped on) but no board issues whatsoever! So imagine this running 250 hours as opposed to running games of MMR! We are pretty confident in this board. We did have a couple shaker motors burn seize up in the process as they are not meant to be run continuously for days on end. #1) Display Color – you can set and save your display color to ANY color can can be configured as RGB settings! Create custom colors, whatever you like – the little square is the color that the display will be (as single color for initial release). 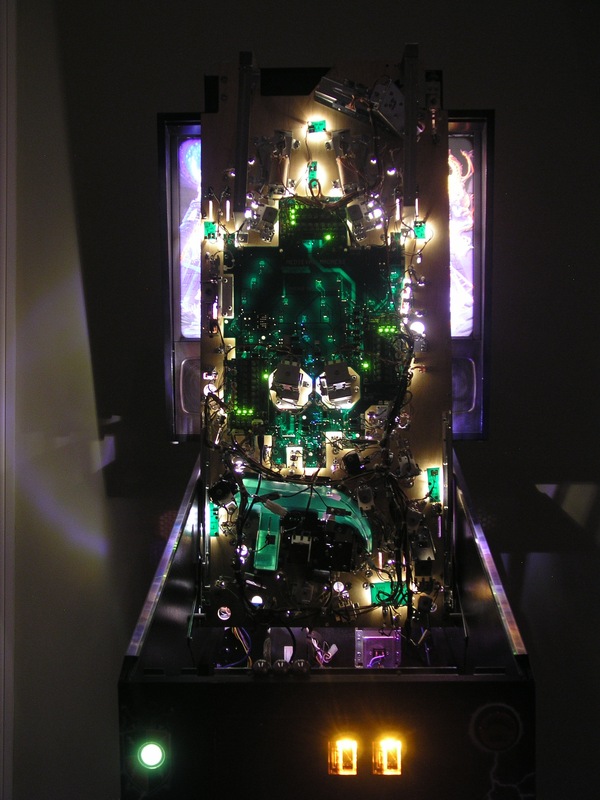 #2) Incandescent Emulation – LED’s are normally very fast on and off, which creates a different effect in a game. Traditional incandescent lights have actually a ramp-up of the light and a ramp-down which gives a ‘smoother’ effect. 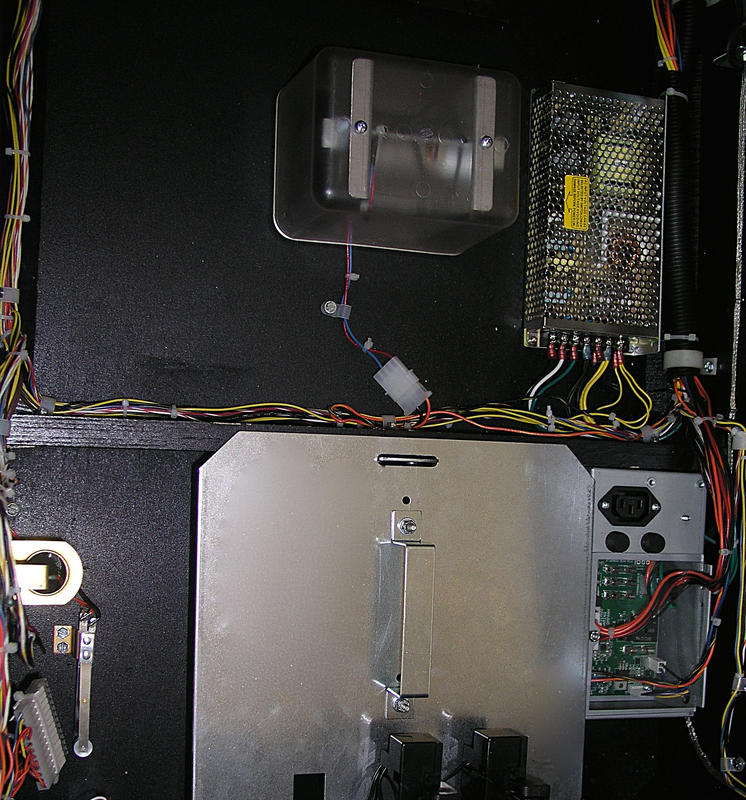 With this configuration option you can adjust to a few settings a range of how the LEDs will behave visually! 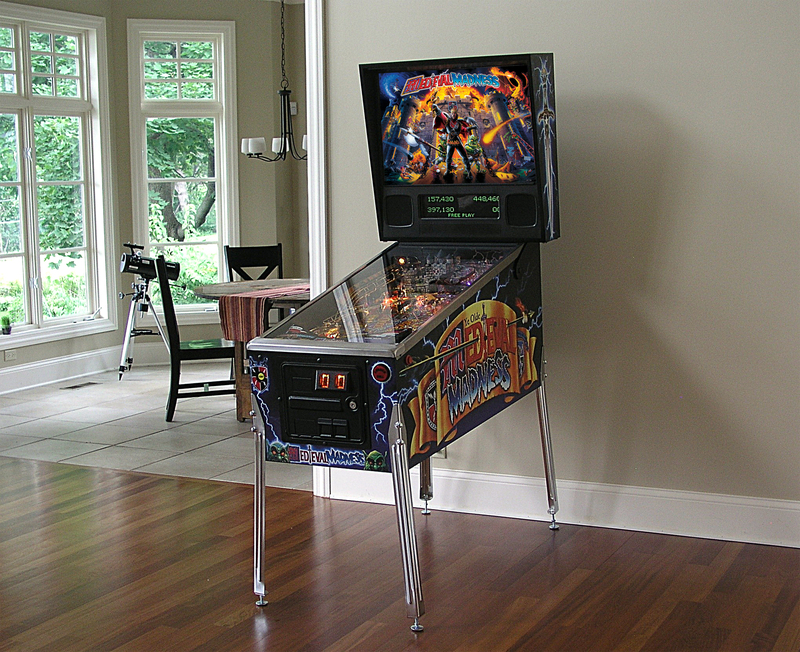 #3) Flipper Strength – You will be able to easily adjust the flipper strength (coils) with this setting. #4) Popper Strength – You will be able to set popper strength as well independently of other settings. #5) Catapult Strength – You will be able to set catapult strength independently as well. 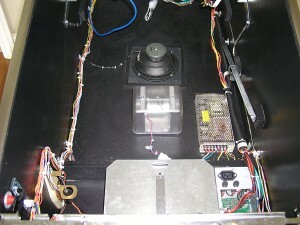 This screen is for the Shaker Motor which did not exist on the original version of the game and is standard on the MMR LE and an add-in option for the MMR Std. #1) You will be able to set the shaker motor strength (including off!) which will allow you to enjoy various levels of shaker motor effects, so you can turn them to the environment that you are in at the time. #2) Shaker motor test- ability to test the shaker motor to insure all is in working order! 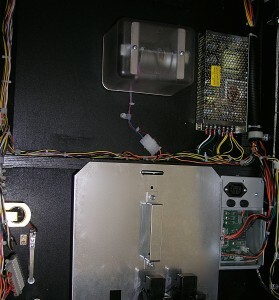 In the original game on the myriad of boards in the backbox (which have been replaced by very little), there were some DIP switches which were used for country setting … well, given that these switches no longer exist, but the functionality that they provided does, we put them in a handy configuration screen. This also makes it a lot easier, as the only way to change these switches was to open up the backbox of the game and change them … No Longer on MMR. 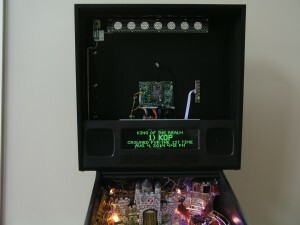 The DIP switch settings will specify a particular country setting for the game. We will include the specifics in the MMR documentation. This entry was posted in Medieval Madness Remake! (MMR), Uncategorized on August 13, 2014 by admin. 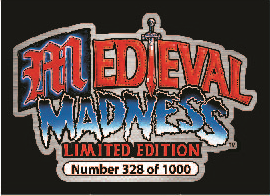 This entry was posted in Medieval Madness Remake! (MMR) on July 1, 2014 by admin. Parts fit/form – despite taking a lot of time to insure all parts are correct, there are also a couple of instances where parts have come in with some re-work needed, as well as in one or two cases where the blueprint was not the latest – some small number of parts still coming in for first article fitting. Fitting of each and every part (verify against blueprint, verify against original part, and fit into machine and test) can take from an hour up (900 parts) … obviously for high volume manufacturing every part needs to be spot on. 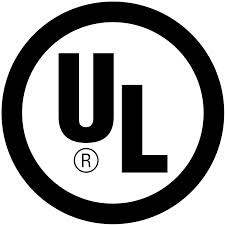 UL/CE testing – this is a required pseudo government agency to insure that the product is safety and certification tested. Testing takes weeks with any iterations required adding time. UL so far is positive and has been reviewed by SPI and preliminary by UL, but UL formal testing is ongoing, so there is always a risk in this process. 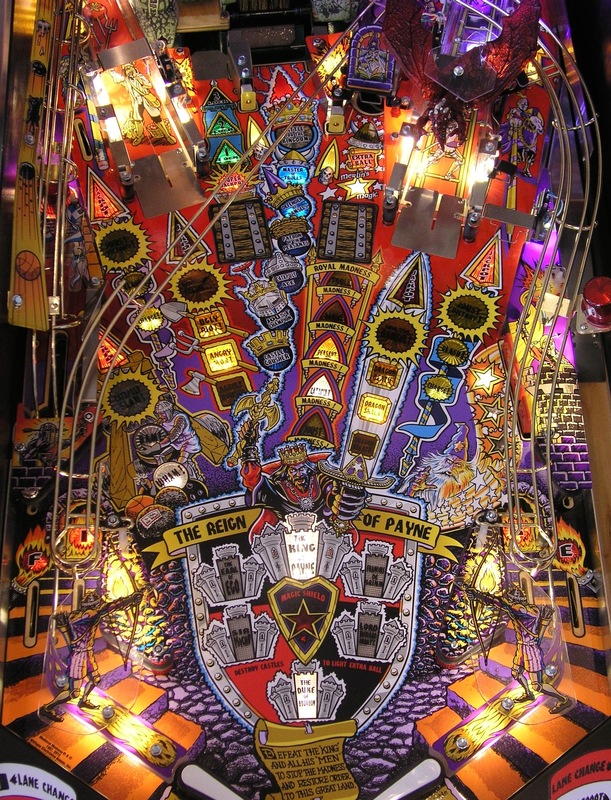 Scheduling – we are putting MMR into the main Stern Pinball Inc (SPI) assembly line, so we need to be scheduled in such that MMR is ready and SPI line is ready. Note that everyone is headsdown on keeping to a schedule and a date – and things can move based on any of the above major factors and a number of minor issues. But we are working to these objectives and we are very very close and resources have been allocated to the assembly, time slots allocated in the SPI line, as well as all parts ordered, most in, and some stragglers coming in every day. Build pre-production games now at CGC and SPI, and then more thru the 2nd week of July which will be the ‘test’ to insure we are ready to put on the line and go. Any build or parts or assembly issues will need to be quickly addressed! Main line game production set to begin last few days of July, and that will occur in 3-4 different assembly slots to insure that we have the proper pace of game, as well as track parts / supply chain availability. Expected 100+/week rate of assembly, and will span over several months. Exact slots after the initial 2 batches to be determined based on how the initial games roll off the line, as well as to pace the shipping logistics, etc. SPI also uses the line to build their games, so we will be switching based on the scheduling of the various SPI game builds and MMR progress. So, we are in the millions of $ of parts ordered/received and are moving ahead with the build and release of the game! We have CGC and SPI very focused on doing what they need to do to move the game thru assembly, and we will next be working with the resellers to finalize the orders, shipping details, etc. 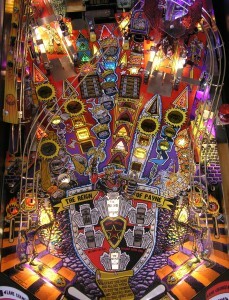 Note that due to the trim option (gold, black, stainless/zinc), this creates some complexity for manufacturing and it has been decided that the games will be built in groups of a certain quantity by trim color to avoid any mixups or confusion, and that will then translate to batches of specific trim color games going out in waves. The exact quantities and how they are batched will be determined as we get the specifics of the orders in the next couple of weeks (hence the July 10 ‘hard’ deposit date, etc). We are excited that we are at the final stages of getting the MMR and we are now all hands to focus on the assembly, final test, and fulfillment stage of the project. We will be providing updates as well as working with the resellers on the logistics site of fulfillment and will update on that as we get confirmation of exact orders, option details, etc.